Hoisting capacity of 1,050 t This provides the possibility of field development in a water depth of 3,500 m.
Use of collars instead of tensioners This system replaces friction based systems (tensioners) and provides less risk in the event system failure of dropping the pipe. Open tower concept allowing installation of in-line structures: Deepwater field developments are a combination of pipelines and structures like templates, Inline Tee Assemblies (ITA), PipeLine End Manifolds (PLEMs). etc. 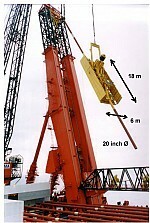 Using the open J-Lay tower, all these structures can be installed with one vessel, improving the project schedule and reducing mobilization costs.